If there’s a thread of consistency linking Shia LaBeouf’s carefully cultivated personal style dictum of “I’m late for class”, it’s that each and every rugged look is as unhinged as the next. 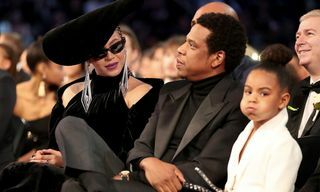 But there’s a sartorial lesson to take away here and it’s to DGAF. 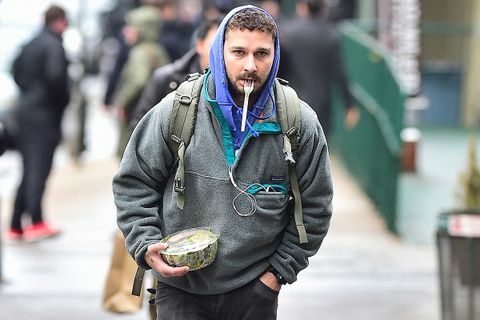 The troubled actor has long manicured an off-duty aesthetic that’s very “hipster or homeless” but a closer look at some of his most iconic normcore style moments reveals LaBeouf’s approach to fashion is a lot more thoughtful than you think.  The fashion world has often speculated that the actor’s penchant for military and athleisure styles is a huge inspiration for West and his YEEZY line. 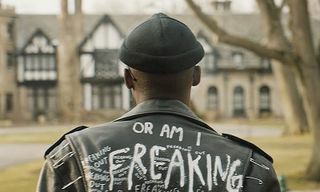 While LaBeouf is certainly guilty of a string of unforgivable fashion moments such as aqua blue crocs, the actor’s more comprehensive body of fire ‘fits is impossible to overlook. In fact, his penchant for unassuming stonewashed military steez, outdoor tech-wear, sneakers, hiking boots, ironic graphic sweatshirts and generally ambiguous threads that look as though they’ve been strewn straight out the $1 barrel of a Salvation Army is all horrifically on-trend. We’ve seen the hiker daddy look enjoy runway major rotation at Martine Rose and Balenciaga for SS18, and the haggard uniform has long been a defining feature at YEEZY, not to mention his unmethodical approach to styling that’s basically de rigueur at any Gosha Rubchinskiy and Vetements show. Whether totally accidental or rigorously calculated, Shia LaBeouf is a bonafide fashion icon and we’ve rounded up the actor/artist/troll’s finest ‘fits to prove it. Here’s an expert lesson in how restricting your sartorial palette to a low-key military grade of khaki and sand can equal effortless style. It’s true that keeping hydrated is the very best thing you can do for your look, and Shia gets it, completing his look with a re-useable bottle. While Shia’s outfit might seem a little slipshod on the surface, the deft details such as a delicate sock-tuck, a perfectly oversized vintage jumper, and baggy track pants all hint that his style isn’t as aimless as he wants us to think. Also, sealing his look off with a pair of hiking boots is a cue straight from Demna Gvasalia’s playbook. No doubt there’s an ironic graphic T-shirt or sweater lurking in the depths of your wardrobe and now might just be the time to whack it out, as aptly demonstrated by Shia above. Shia’s penchant for military steez continues with some fantastically baggy cargo pants probably sourced from an LA surplus store. The whole look screams YEEZY season three, and there’s no mistaking the similarities between Shia’s boots and the YEEZY suede and nylon military boots either. Shia has clearly been noting the proportions of his silhouette as well as the limitless possibilities offered by a simple tuck of the T-shirt. Here, the actor cinches it all into his sweatpants, while mirroring the effect above down below by tucking his sweatpants into his socks. Sartorial symmetry as pioneered by Shia LaBeouf. Perhaps the most infectious thing about Shia’s style is his unapologetic nonchalance. Yes, that’s him walking in hand-in-hand with his mom, in a tank top that reads “beauty”, a pair of DIY denim cutoffs which he probably hacked using scissors with his feet, all confidently finished off with sliders and socks. Zero coordination and zero fucks. Shia’s spandex moment is particularly iconic. There are few problematic celebrities whose blasé attitude infects their styling choices with such force. As weird as this look may be, its parallels to much of the off-kilter runway styling right now is very visible. Is it any coincidence that Balenciaga delivered over-the-knee hot pink spandex pumps for Spring 2017? I think not. Yet another thrift store sourced stellar look, featuring a grubby looking dad cap, a vintage (and probably dubiously stained) T-shirt, sweatpants and lord behold, a pair of Uggs. While a hardened critic might rule this is a fashion felony, I’m not mad about it, and given that ugly sneakers are trending, it’s probably a matter of time until this catches on too. A true street style star in the making. I’m very interested to know which thrift stores Shia frequents in LA county as his finds are truly fantastic. Here’s a deftly oversized sports top, expertly paired with minimal khaki cut-offs. Sometimes, even the most minimal of looks can have a real impact, and Shia’s effortless styling of a washed-out sweat-shirt, jeans and sneakers is a true testament to that. 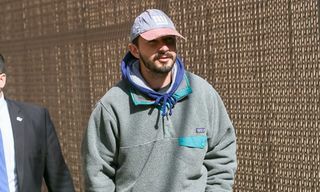 Shia’s collegiate hippy look is a firm lesson in layering, and the rugged, hard-worn Patagonia hoodie is exactly how the brand’s sustainable wares should be worn. While Shia’s battered sneakers might not steezy at first glance, it somehow works with this vintage T-shirt and stained sweatpants. Very anti-fashion. This threadbare look is top-grade steez. A striped flannel shirt is worn with bleached denim shorts, green socks, and brown hiking boots. Given that Shia loves to layer it on up, you might be quick to think summer isn’t exactly his season of steez. Well, here he is to prove you wrong. Deceptively simple, he wears a striped T-shirt, DIY workwear pants cut-off to show off raw detailing, all accessorized with a bulky backpack and simple sneakers. For more celebrity street style, here’s why Conor McGregor is the world’ best-dressed athelete.